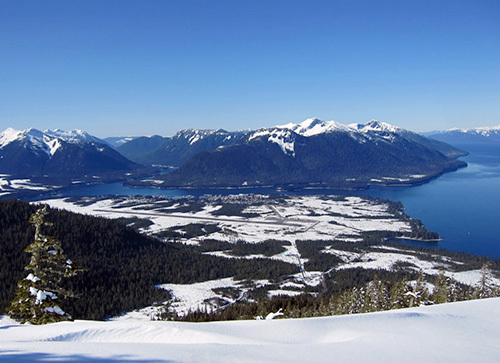 (SitNews) Ketchikan, Alaska - The U.S. Forest Service has formally withdrawn its March authorization of the Mitkof Island Project's large 35-million-board-foot timber sale. Documents were made available to the public on its website November 17th. Five environmental organizations sued the Forest Service in May 2015 to stop the sale. Those organizations - the Greater Southeast Alaska Conservation Community, Cascadia Wildlands, the Center for Biological Diversity, Greenpeace and the Alaska Wildlife Alliance - are represented by attorneys with Crag Law Center in Portland and Cascadia Wildlands in Cordova. These conservation groups says the formal withdrawal notice provides hope to those who depend on Mitkof for a variety uses, including hunting, recreation, fishing and wildlife viewing, that destructive old-growth timber sales like the Mitkof project will indeed be a thing of the past. Owen Graham, Executive Director of the Alaska Forest Association, provided a response to the announcement by email to SitNews, "We hope the sale is revised, improved and advertised by early spring so we don't lose another logging season." Graham said, "We were really looking forward to this timber sale, because our timber supply is far short of where we think it should be." The Forest Service also designed the timber sale for helicopter logging to minimize the amount of road construction said Graham. Graham said, "The Forest Service used a non-typical method to estimate the amount of timber that could be economically recovered by helicopter logging and we believe the volume estimate and the appraised minimum rates are much too high. It didn't help that some of the markets have declined some while the sale was being prepared." "With the apparent error in the volume and appraised rates, it makes sense for the agency to take another look at their cruise and appraisal and this also give the agency time to address the concerns that the appellant raised," said Graham. Tongass National Forest Supervisor M. Earl Stewart notified the Petersburg District Ranger on November 6th, that after considering the local industry's concerns with the proposed sale and reviewing certain aspects of the project's implementation, an opportunity exists for improving the project's scope of work to both provide a supply of timber that facilitates the transition to an industry based primarily on young-growth, as well as support the transition of the existing local industry. Stewart directed the Petersburg District Ranger to withdraw the Decision Notice of Finding of No Significant Impact for the Mitkof Island Project Environmental Assessment. “The agency was forced to walk away from this timber sale because it failed to listen to serious environmental concerns raised by the local community,” said Gabe Scott with Cascadia Wildlands. “If the agency simply intends to redraw the project’s scope, it will still be faced with the same realities about the needs of subsistence hunters and the precarious state of old-growth dependent species on Mitkof Island." The proposed timber sale is located in the center of the Tongass National Forest, near the communities of Petersburg and Kupreanof. Last month the USFS, whose cursory environmental review found that logging the remaining old-growth in the project area would have no significant impact on the forest or wildlife, announced its plan to withdraw the decision to authorize the project. “Mitkof Island has been hard hit by 60 years of industrial logging,” said Becky Knight of Greater Southeast Alaska Conservation Community, a Petersburg resident. “Subsistence hunters from the community rely on deer as a primary source of protein, but for years have been faced with critically low deer populations and severe harvest restrictions. This area of the Tongass needs a long period of recovery, but this sale targeted some of the few remaining stands of important winter deer habitat." The Mitkof Island Project's plan was to provide units for small timber sales, a one-time predominantly helicopter-based offering with a limited number of ground-based harvest units requiring road construction, and supported a programmatic microsale program on Mitkof Island.